I’ve made banana breads that have ended up too dry and some too wet. I’ve made them sweetened with white sugar, brown sugar and some with barely any sugar except for that in the bananas used. I’ve made them “fattened” with vegetable oil and butter (both melted and softened). I’ve made some that had tons of bananas in them and some a mere one or two. And some with add-ins like crushed pineapple, dried fruits, nuts, cinnamon and lemon peel. I’ve used mixes, too (I shamefacedly admit), and those usually end up disappointing, the banana flavor in them akin more to candy than fruit. 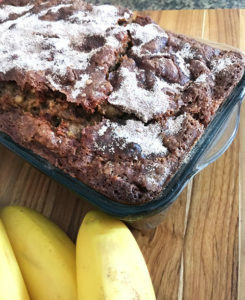 A Whole-Grain Banana Bread with a whopping four to five bananas involved, along with some whole wheat flour to add to the health factor, plus a topping of cinnamon sugar. It all sounded good. Plus, I had a surplus of bananas (I made sure of it). Let’s face facts — this is usually why banana bread happens. 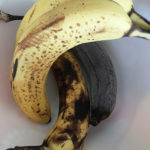 We have bananas that have gone past their prime (which, for me, is pretty far…but everyone has their own scale of tolerable banana ripeness for eating). 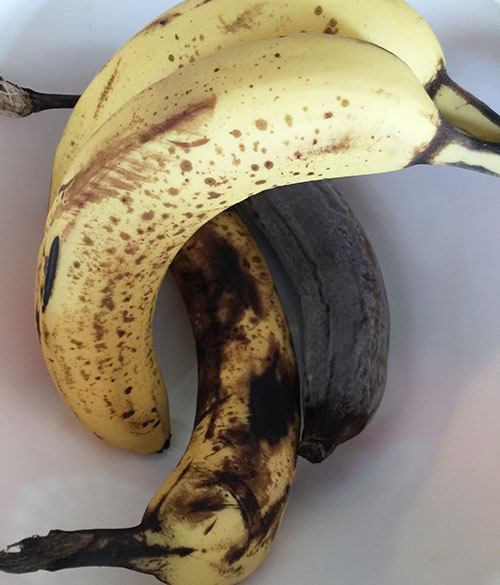 Sometimes you have bananas that have gone south, and you do not have the means to make banana bread. I have a tip — throw the banana (in its peel) in the freezer. Yes, it will fall out and hit you on the foot. But that’s OK! 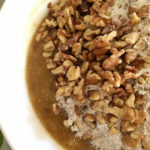 Because when you are ready to make your bread, thaw it out for a half-hour or so, then slice it open into your mixing bowl and watch the banana sludge (not slug) — already mashed — slip out from the banana incision. 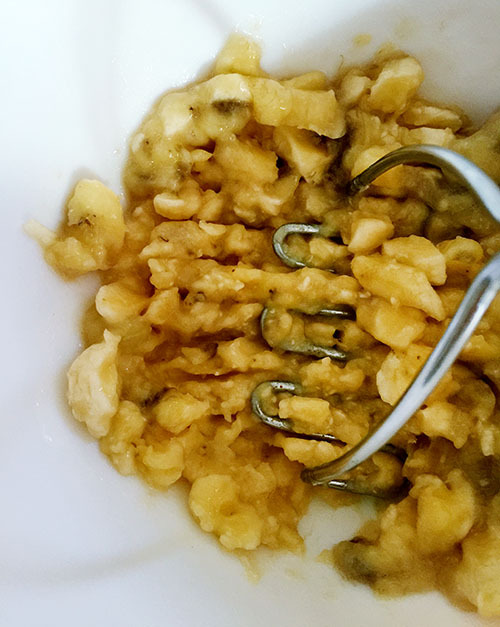 For bananas that are not in sludge form, a potato masher is handy to get all in proper pulverized condition. 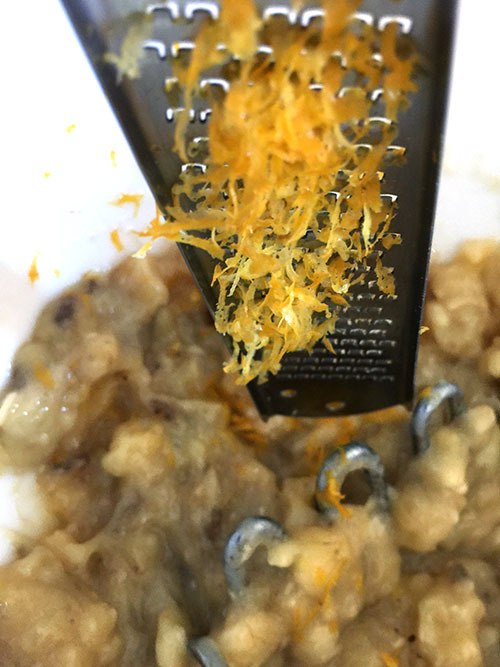 I decided to add lemon zest to this recipe (my only variance), because I’ve found it to be a nice complement and brightens the deep sweetness of bananas. And the fact is, I want to add lemon zest to everything. 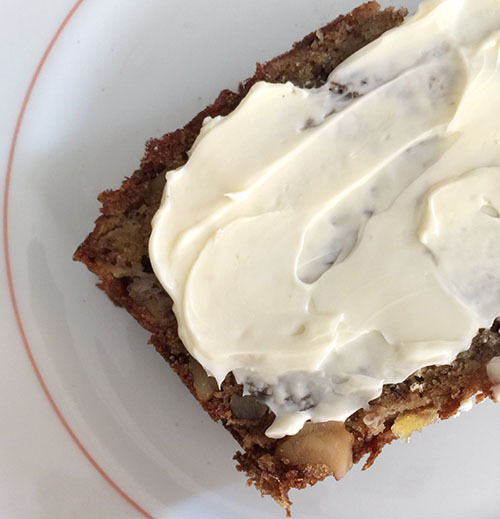 This recipe reminded me of the many reasons I like to make banana bread, one of which is how no-fuss and easy it is. 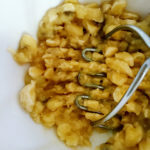 Wet ingredients — eggs, oil (which I think is best for most quick breads for the moistness factor) and vanilla are mixed with the bananas, along with brown sugar (sure to add a lot of nice flavor to the bread). Dry ingredients, including an equal amount of white and whole wheat flour, baking soda, baking powder, salt and cinnamon, are combined and added to the wet. 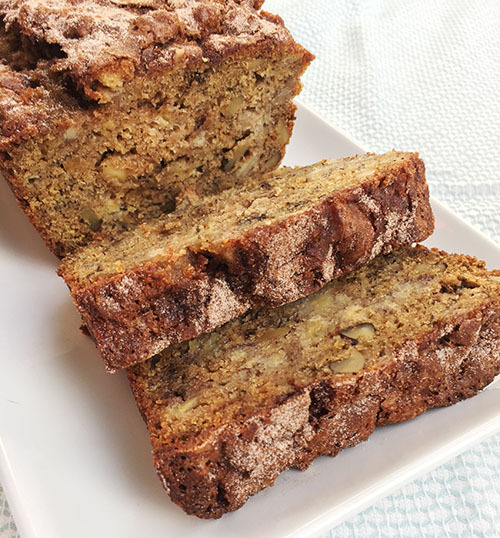 I often get requests for nut-less banana bread (don’t know why), but this version not only had walnuts, but TOASTED walnuts, which, after using both toasted and un-toasted nuts in recipes, I have vowed they must always be toasted for optimal flavor. My mom believes in baking in glass, particularly with bread, and I’m inclined to align with her on this matter…the breads tend to bake more evenly, you can see the state of their doneness, and it gives me an excuse to break out my beautiful, faintly blue Fire King loaf pans from Abilene, Kan., that were absconded from me from American Airlines in Chicago in a modest duffle bag that was determined to be a needed checked item (despite the circus trunks that were being wheeled on in front of me to overload the overhead bins). 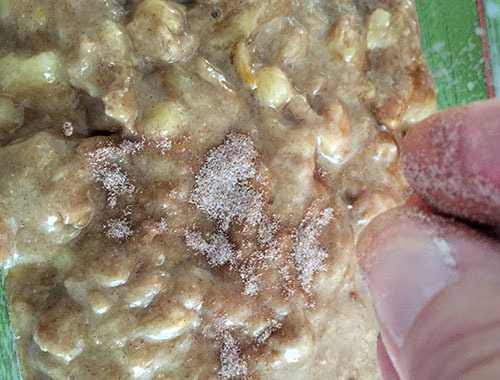 Here’s another reason to make banana bread: the smell! The aroma of banana bread baking is its own thing. It doesn’t really smell like bananas, but some new version of a new thing, buttery even when there is no butter, a specific smell that I can’t qualify that offers enough comfort that this baker — as she usually does — found herself leaving and re-entering the house just to meet the fragrance, again and again. This baked up to a nice ample loaf. As the recipe suggested, I tented the loaf with foil during the last 10 minutes of baking so it would not over-brown. Everyone has their moistness preference for banana bread, and if I’m honest, that’s somewhat what has kept me searching. My ideal version would be one slightly drier than a very dense, firm bread pudding. In other words, moister than most quick breads. This bread has it! King Arthur Flour may have just cracked the banana bread code (of course they would)…this bread has the right amount of bananas, the right amount of oil, the right amount of flavor with cinnamon and brown sugar, the boon of healthy whole wheat and the crunch of toasted walnuts. I may stop searching (for at least a while). But I won’t stop making. or butterscotch chips, sunflower or pumpkin seeds, or other mix-ins of your choice. Preheat the oven to 350°F with a rack in the center position. Lightly grease a 9″ x 5” loaf pan; if your pan is glass or stoneware, reduce the oven temperature to 325°F. In a large bowl, stir together the mashed banana, oil, sugar, eggs, and vanilla. Weigh your flours; you’ll find their weight by toggling to “ounces” at the top of the ingredient section above. Or measure them by gently spooning them into a cup, then sweeping off any excess. 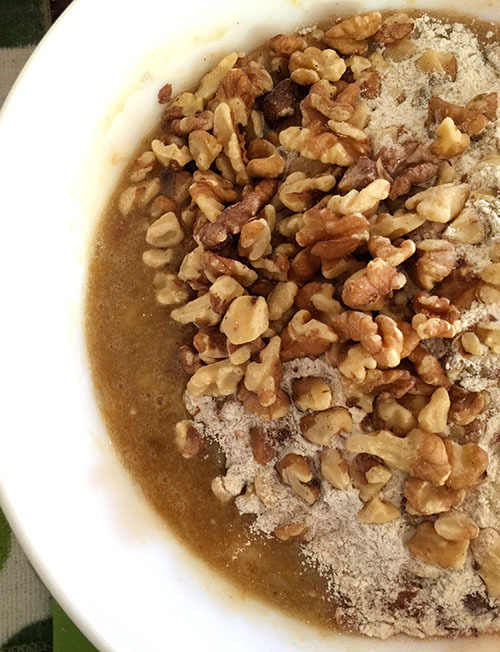 Mix the flours, baking soda, baking powder, salt, cinnamon, and chopped walnuts into the banana mixture. Scrape the bottom and sides of the bowl and mix again to thoroughly combine the ingredients. Scoop the batter into the prepared pan. Mix together the sugar and cinnamon and sprinkle over the batter. Bake the bread for about 60 to 75 minutes, until the bread feels set on the top and a paring knife (or other thin knife) inserted into the center comes out clean, or with just a few moist crumbs (but no wet batter). If you have a digital thermometer, the bread’s temperature at the center should register about 205°F. If the bread appears to be browning too quickly, tent it with aluminum foil for the final 15 to 20 minutes of baking. Note: If baking in a glass or stoneware pan, increase the baking time by 10 to 15 minutes. Remove the bread from the oven. Cool it in the pan for 15 minutes, then loosen the edges, and turn it out of the pan onto a rack to cool completely. 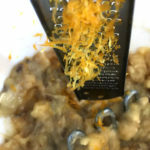 Blogger’s Note: I added 1 teaspoon finely tested lemon peel to the wet ingredients in this recipe.